Eggplant is originally from what is now India and spread throughout the world, arriving in the New World with European colonization. In the Caribbean and parts of Central America, the preference is for varieties that are light purple or pink, sometimes with white striations (Figure 1). In Puerto Rico, one OP variety used is called rosita (Pink in Spanish), and was considered the most commonly used OP variety in Puerto Rico in 2006. Another common OP type in 2006 was called rayada (striped in Spanish). 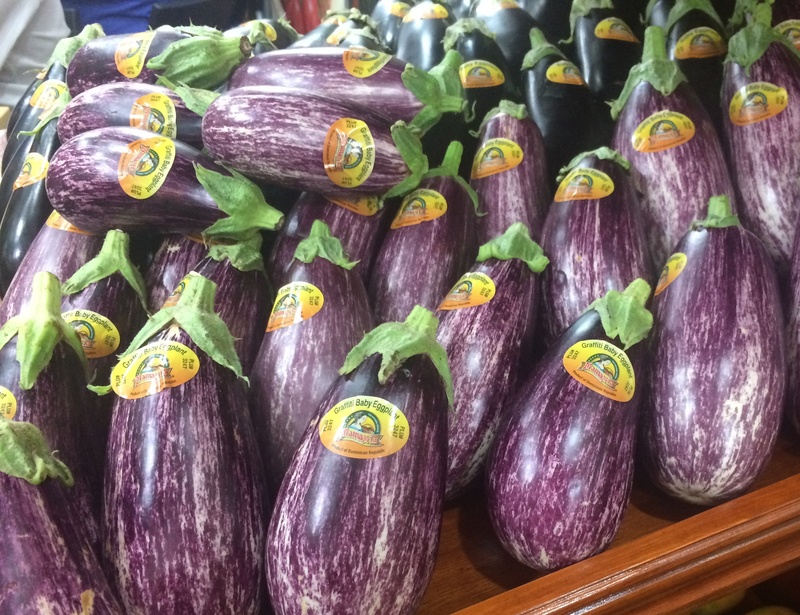 Dark purple or black eggplant varieties, found in traditional markets in the US, are not common in Puerto Rico (Fornaris, 2016; see references below). 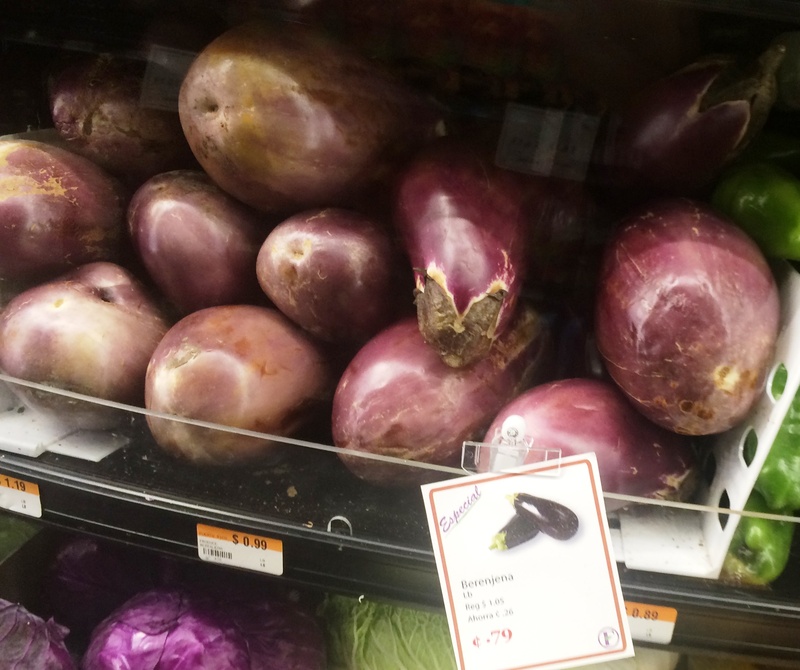 In the Latino trade in the Northeastern United States, this type of eggplant is "Dominican eggplant" (berenjena dominicana in Spanish) (Figure1, Figure 2). It is commonly found in markets in Puerto Rico (Figure 3), Dominican Republic (Figure 4) and Cuba (Figure 5). 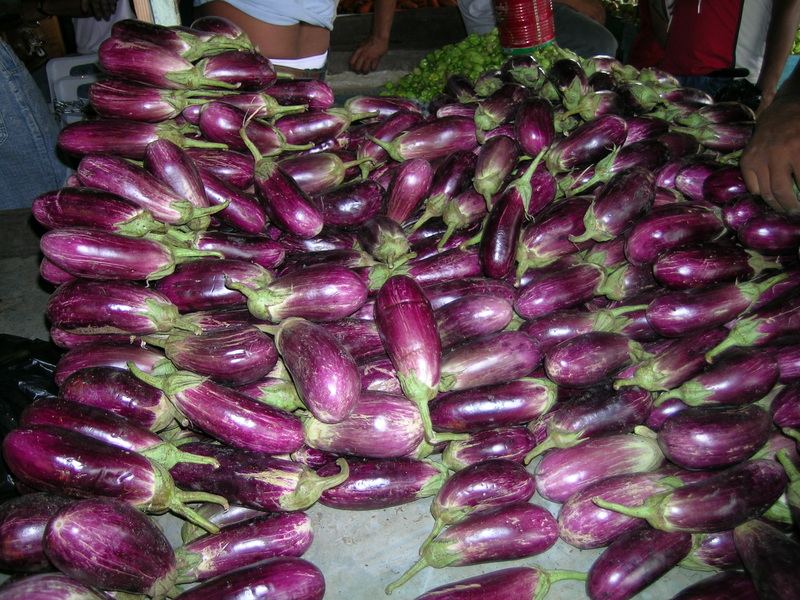 The Dominican Republic produces many fresh products for the growing ethnic trade in the United States, including crops popular among Asians, which includes types of eggplant varieties for Asian markets. 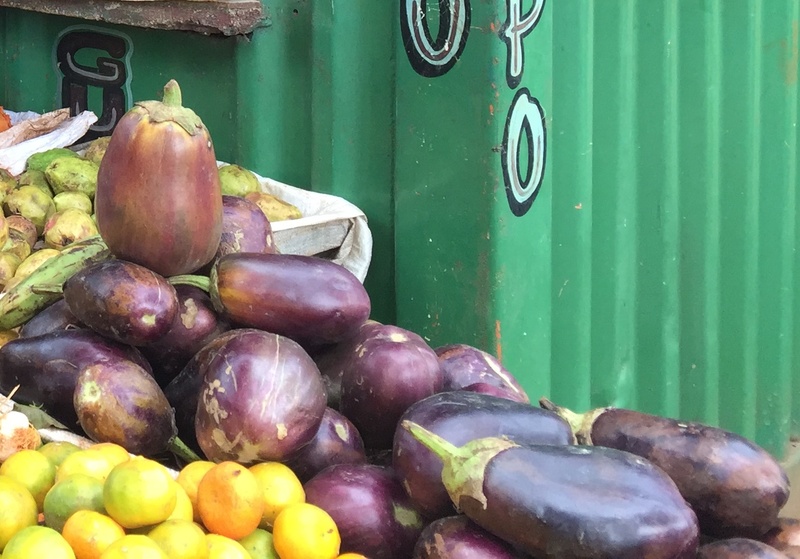 Some of these varieties, which are also pinkish, can also be found in Dominican Domestic markets (Figure 6), but not so much in Latino markets in the Northeastern United States, where the more traditional type of berenjena dominicana is found. 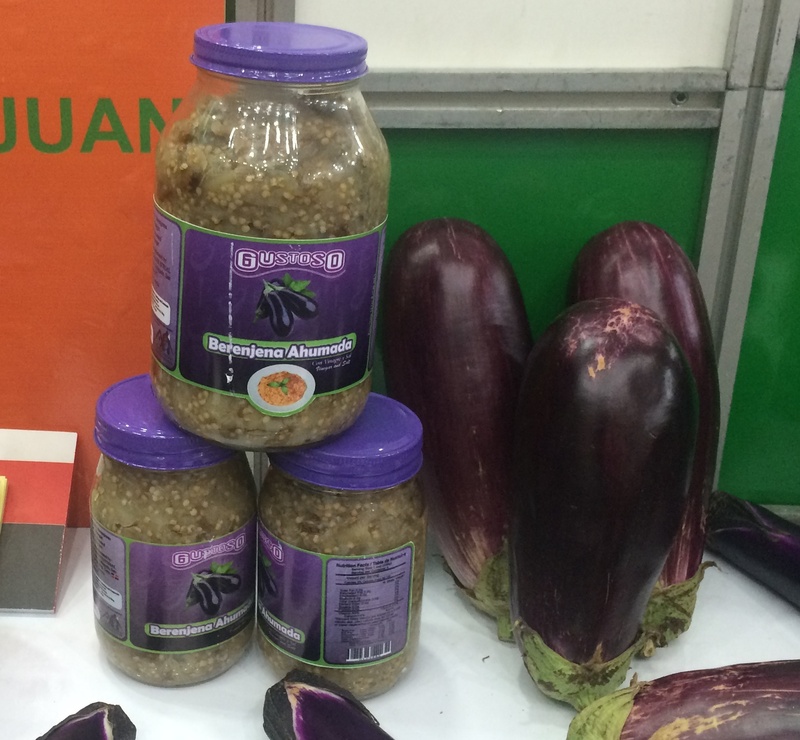 At a tradeshow in Santo Domingo, Dominican Republic, a striped variety for export was found (Figure 7), along with bottled smoked eggplant, most likely for the domestic market or for the Latino market in the US given that the label is in Spanish (Figure 8). Eggplant is used in several recipes, sometimes as a replacement for meat, and where it is stewed (guisado in Spanish), such as berenjena guisado (eggplant stew). 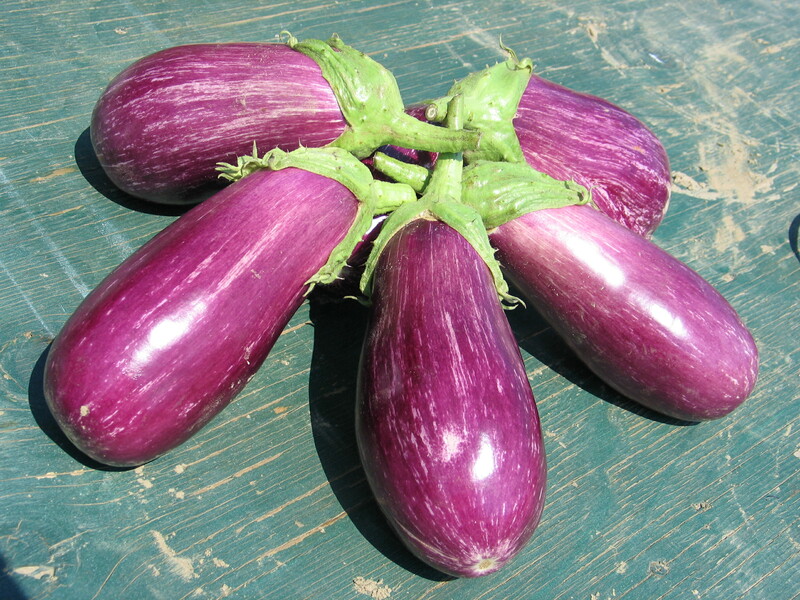 As the same genus and species, Solanum melongena, as traditional eggplant varieties grown in the Northeastern United States, similar row spacing and fertility is recommended for Dominican eggplant varieties. 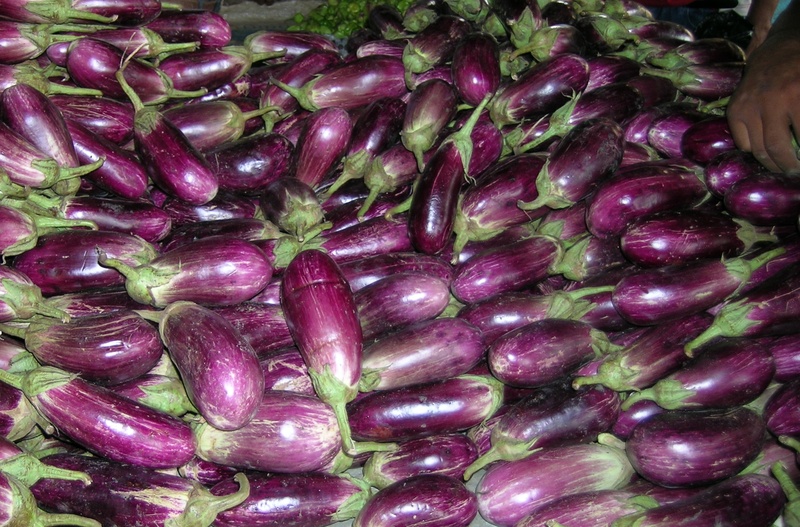 s. For information on production and management of eggplant, refer to the New England Vegetable Management Guide and click on "eggplant". A replicated research trial at the UMass Research Farm in 2005, the variety 'Zebra' (Figure 9), a striped eggplant type found in latino markets, yielded 25,000 lbs/A. (Mendonca et. al., 2006; see references). 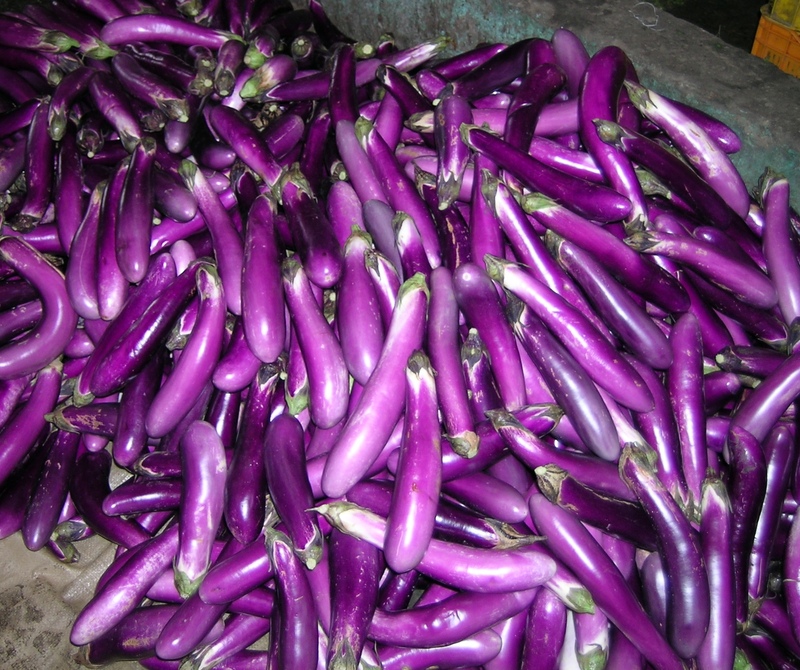 There are many varieties of pink and striped eggplant types available from many different seed companies. The variety 'Zebra' that was evaluated at the UMass Research Farm in 2005 does not seem to be available as of 2016. As always, it is recommended to trial multiple varieties the first time growing a new crop type to see how they perform on your farm and system. Fornaris, G.J.. 2016. Conjunto Tecnológico para producción de berenjena: Variedades y selección. Universidad de Puerto Rico Recinto Universitario de Mayagüez Colegio de Ciencias Agrícolas. Estación Experimental Agrícola. Publicación 165. Mayo 2006. http://www.eea.uprm.edu/wp-content/uploads/sites/17/2016/03/BERENJENA-Va... Viewed on April 26, 16.